With almost half the world’s population tuning in to the 2018 world football event, high-resolution and reliable, live video of the games was critical to broadcasters throughout the globe. Some of the worlds’ premier public broadcasters trusted FOR-A to deliver pristine imagery in a multitude of formats to fervent fans watching the quadrennial event. Four FOR-A FRC-8000 multi-format frame rate converters and one FOR-A MFR-8000 4K/8K routing switcher were used by European broadcasters to supply properly formatted, live coverage. A premier Japanese broadcaster went with six FRC-9000 4K/HD frame rate converters for HD and SD signal conversion for error-free live broadcasts of the month-long contest from Russian to its viewership in Japan. The FRC-9000 4K/HD frame rate converter supports 3G, HD, and SD. It provides SD to 3G/HD up conversion; interlace to progressive conversion; conversion with motion compensated processing; optional 4K (UHD, SQD/2SI) support; and simultaneous conversion of two-channel video inputs. 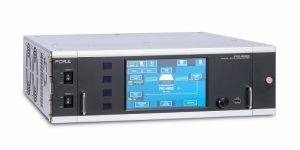 The FRC-8000 multiformat frame rate converter includes motion compensation technology, and HD and SD format conversion. Up converter, down converter, and cross converter functions are also provided for converting to various formats. It features HD-SDI and SD-SDI input and output and input and frame rate conversion for conversion to a wide range of SDI formats, such as: 1080/59.94i, 1080/50i, 720/59.94p, 720/50p, 525/60, and 625/50. Up, down, and cross conversion is standard on the FRC-8000, as is up conversion from SD to HD, down conversion from HD to SD, and cross conversion from 1080i to 720p.